Explanation: British astronomer Sir William Herschel discovered Titania and Oberon in January of 1787. He wasn't reading Shakespeare's A Midsummer Night's Dream though, he was making the first telescopic observations of moons of the planet Uranus (a planet which he himself discovered in 1781). In January of 1986, nearly 200 years later, NASA's robot explorer Voyager 2 became the only spacecraft to visit the remote Uranian system. 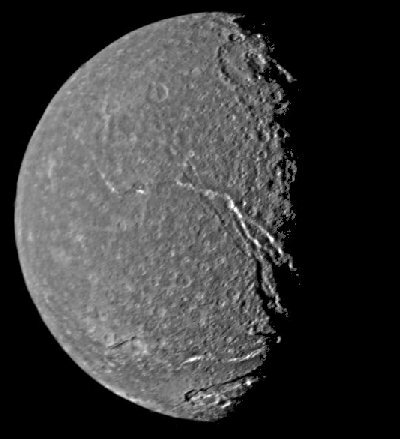 Above is Voyager's highest resolution picture of Titania, Uranus' largest moon. The picture is a composite of two images recorded from a distance of 229,000 miles. The icy, rocky world is seen to be covered with impact craters. A prominent system of fault valleys, some nearly 1,000 miles long, is visible as trench-like features near the terminator (shadow line). Deposits of highly reflective material which may represent frost can be seen along the sun-facing valley walls. The large impact crater near the top, known as Gertrude, is about 180 miles across. At the bottom the 60 mile wide fault valley, Belmont Chasma, cuts into crater Ursula. 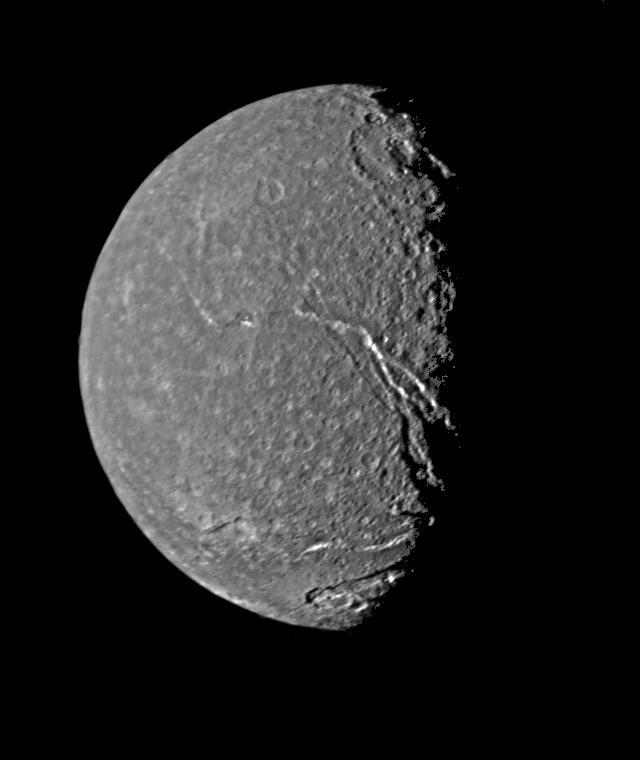 Titania itself is 1,000 miles in diameter.